Beers loved by a small segment of the beer culture. Love Lambics and Geuze? Look no further! Starting in 2019, this tour is two nights longer than in the past to be able to take in the larger numbers of lambic producers and to create a better overall pace of this ambitious tour. This tour will begin in Brussels with two nights in Bruges and five nights at the famous Martin’s Red Hotel in Tubize, home of the champion Belgian Red Devils football team. This tour will include the Toer de Geuze in odd years and in even years, Night of the Great Thirst International Gueuze & Kriek Festival and the Zythos Beer Festival. While all spontaneous beers are wild, not all wild beers are spontaneously fermented. There’s a lot to know about how these beers are produced and the whole history of it and process is fascinating. Gaining an understanding of behind-the-scenes of these special beers will make you appreciate them even more and cause you want to explore even deeper. The exact places we will visit will vary depending on the schedules of the brewers and blenders, but rest assured you will be satisfied in in our sorties into this uniquely Belgian beer world.We will also explore Flemish Red and Flemish Brown ales, which are in a wild beer league of their own and employ different techniques to achieve their enjoyable flavors, as opposed to lambics. We will also visit De Lambiek Lambic living history center and eat and drink at some of Belgium’s finest atmospheric beer cafes specializing in Lambics, geuze and Flemish ales. All this combined with the bucolic landscape, palpable history and fine cuisine of Flanders makes for a memorable beer tour. Join us, won’t you? Seven nights accommodations in nice, friendly, hotels. Two nights in the Old Town of Bruges and five in Tubize, southwest of Brussels in Lambicland. Also consider The Legendary Zythos Beer Festival and Wild & Spontaneous Beer Festival Combo Package Tour of Belgium April 24-May 6, 2019. Cost is $3790 per person based on double occupancy. There is a single supplement of $675 if requesting a single room or traveling alone. Tour deposit* is $400 per person. LEARN MORE ABOUT TOER DE GEUZE BY CHUCK COOK AND BELGIAN BEER SPECIALIST. 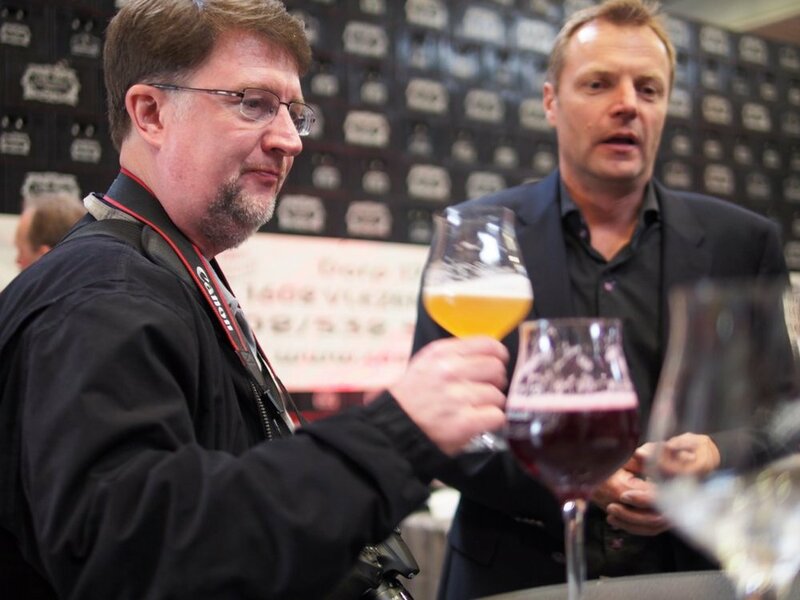 Chuck Cook with Dirk Lindemans during the 2015 Tour de Geuze, Belgian Beer Me Tour. Chuck Cook, aka, “The Belgian Beer Specialist”will be joining us on the 2019 Wild & Spontaneous tour as a continuation of his history of joining us in 2015 & 2017. He has traveled to Belgium more than 30 times since 1994 to explore, experience, and enjoy its incredible beer culture. Chuck has visited more than 170 of the 195 or so breweries that now exist in Belgium, including multiple visits at all the Trappist Abbey breweries, and most of the other established breweries in “The Beer Country.” Chuck Cook is one of the truly great names in beer journalism, whose company you will enjoy throughout this thrilling itinerary. Day Four, Thur., May 2 • Tubize Morning begins with a visit to De Lambiek Lambic Visitors Center in Alesemberg. “The center immerses the visitor in the flavors, aromas, sounds and textures of Lambic beer. With its welcoming, spacious and stylish interior, the centre has a charm all of its own. Start your voyage of discovery here in the world of Lambic brewing, Gueuze blending and explore the wider region around. Lambic is a beer that ferments spontaneously and matures in wooden casks. Optimum conditions for this spontaneous fermentation only occur in the Senne Valley and Pajottenland. Lambic beer provides the basis for the traditional Gueuze and Kriek beers.” We’ll see a movie, view some exhibits then sample some lambics in their cafe. Next, it’s on to the newish 3 Fonteinen in Lot, Belgium. This massive complex, located in a former dairy ice cream warehouse, is the next phase of 3F. It features, blending, barrel-aging, bottling, a shop, a Schaarbeekse cherry orchard and the lambik-o-droom cafe. A brewery is planned for the future. For now, they continue to brew at their original location in Beersel, about 4 km away. Our host for this special visit will be the very endearing brewer/blender Armand Debelder. He has made a name for himself through the years as one of the lambic rock stars and today you will get meet the passionate man and to experience his works of art. We’ll follow this visit with lunch at 3 Fonteinen Restaurant in the nearby village of Beersel. It is run by Armand’s Brother Guido and nephew Thomas. This afternoon, we pay a special visit to Pierre Tilquin at Gueuzerie Tilquin, located just inside Wallonia, but still in the Senne Valley. Established in 2009, Pierre is no longer the new kid on the block. Be prepared to be amazed. Afterward, we’ll pay a visit to one of Belgium’s premier bottleshops, Streekproduct Centrum in Halle, to stock up on beer for our bottle shares and to bring home. They also carry a wide range of other regional products. This evening, we’ll have an informal bottle share at our hotel. Day Six, Sat., May 4 • Tubize Get ready for a marathon day of beer hunting at the 12th Anniversary of Toer de Geuze (TDG). Today is a big day and it will be akin to speed dating with quick approximately 1-hour visits to four lambic producers. Timmermans -These guys have been gaining their street cred back in recent years and have an extensive program. They also have a nice, atmospheric, wood-panelled taproom. Part of the festivities will be outside. This is a big place! Founded in 1702, it is the oldest of the lambic breweries. Lindemans - Known for their widely distributed fruity and sweet lambics, they also have a couple rarer and well respected ones such as Oude Gueuze Cuvée René and Oude Kriek Cuvée René. Lindemans also provided the base lambic for some other prestigious blenders. Lindemans pulls out all the stops for TDG and this is a nice place to round out the day! 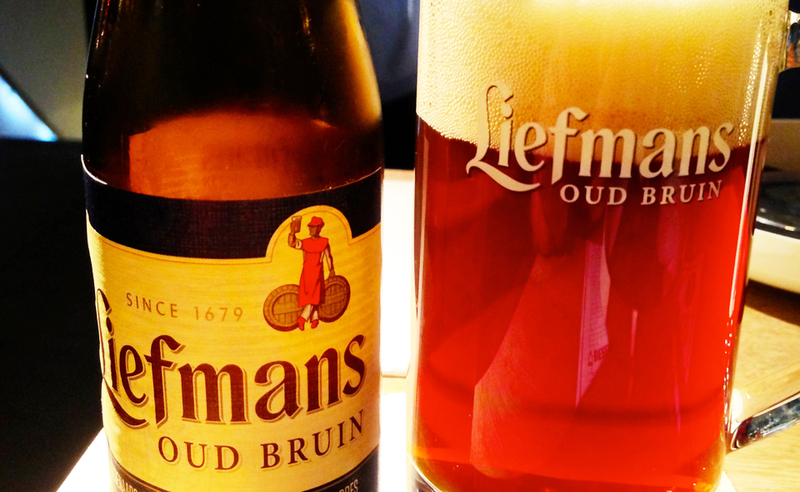 Lunch on your own at Lindemans. Oud Beersel - This is an excellent visit, with a museum, a fine tasting room and retail shop. As a sideline, because they don’t want to put all their eggs in one basket, they also make what I consider to be one the best tripels in Belgium. Boon - Brewers of award-winning oude geuze and fruit lambics. Frank Boon is one of the icons of the lambic culture. His sons Karel and Jos are the next generations of this Belgian Family Brewer. Members of the HORAL contribute lambic to make a special Oude Gueuze called HORAL Megablend 2019. Today, we’ll also have an informal visit to the fairytale-like lambic cafe of the Insurance Against the Great Thirst (In de Verzekering tegen de Grote Dorst). This is possibly the best name you will ever hear for a beer cafe. You’ll have about an hour here to indulge in their extensive list of lambics, some of which are many years old, covered with dust and handled and poured with great care. Be sure to get a video of the bartenders uncorking these ancient beauties carefully placed in horizontal baskets and delicately pouring them properly into their glasses. This is an art form to behold. This is the most famous of Belgium’s lambic cafes with an equally famous story. Day Seven, Sun. May 5 • Tubize Welcome to Day Two of Toer de Geuze. Mort Subite - This is a hard place in which to visit as they do not offer tours, so we are going to tick this one off right away. De Cam - Home of many fine lambics. Blender Karel Goddeau’s story is an interesting one, and his magnetic and charming personality makes a lasting impression. Immediately after have lunch nearby cafe, a favorite of the local people, which also houses a fascinating museum of Flemish culture, which you will be able to explore. Hanssens -Another one that is practically impossible to visit, except for today. Look forward to Lambic Cassis, Lambic Raspberry and Kriek Lambic Schaerbeek, made from rarer Schaerbeek cherries from this region. De Troch - Makes oude geuze and oude kriek and a line of sweetened lambics. Their brewery is a classic example of its era. After a full day at TDG getting our fill of tart and acidic brews, we’ll shift gears and retreat to our Farewell Dinner at the famous Boelewikis Grill in Dworp. After a satisfying dinner and beers, it’s back to the hotel. Tonight, you’ll have time to carefully bubble wrap all the magnificent beers you have acquired on the tour for journey to your beer cellar and then to be consumed leisurely with great pleasure. Don’t be surprised if a late-night bottle share breaks out tonight at the hotel. “So little is known about the origins of lambic that there are three different versions of how the word itself came to be. It might have come from any one of four Belgian villages: Lembeek, Borcht-Lombeek, Onze-Lieve-Vrouw-Lombeek or Sint-Katelijne-Lombeek. Another possibility is the Spanish word lambicado, which means “carefully prepared.” The creation of lambic has also been attributed to Duke Jean IV of Brabant, who in 1428 supposedly tired of the same old brew and hit on the idea of macerating and boiling barley and hops in a still, then known as an alambic. The experiment was a success, and the resulting beer has ever since been known as lambic, according to this version. Old, unblended lambic, close to what was consumed centuries ago, is now easily found only around Brussels and in the Payottenland. Tart and barely carbonated, it tastes more like fine sherry than beer. Much more common are gueuze (pronounced “gerz”), faro and the various lambics sweetened and flavored with fruit. Gueuze, like champagne, is the product of a secondary fermentation process. It takes place when young and old lambic are mixed in a bottle. Gueuze was apparently first produced commercially early in the 1 9th century, to make a more bubbly, beerlike beverage suitable for export. Documents have been found attesting to the export, in 1844, of gueuze to Constantinople and to Rio de Janeiro. Faro is a blend of lambic and mars, a weakly alcoholic and pale liquid obtained by rinsing the grist of a lambic brew. It is generally sweetened with brown crystallized cane sugar. The name comes from the soldiers of the 16th-century emperor Charles V, who called the product “gold liquor” or “barley liquor”–farro in Spanish. Fruit lambics include the traditional cherry (known as kriek, the Flemish word for “cherry”) and raspberry (or framboise, from the French). Other fruits have also been used, with varying degrees of success. They include peaches, grapes, black currants, plums and pineapples. JACQUES DE KEERSMAECKER is managing director of the Belle-Vue Brewery in Brussels, an affiliate of the Interbrew-Labatt group. A connoisseur and gustatory adventurer, he was born in a lambic brewery and studied at the Brussels Institute’s Meurice Brewing Engineers’ School. He was formerly director of the Lamot Brewery in Mechelen, Belgium.